I thought I would show you my table setting for my Easter Guests. I stayed with a pretty simple theme. All my whites and creams and grey with a touch of spring colors from the flowers and my yellow garden boots. For my center piece I just added some daisy's to the yellow garden boots and my friend gave me this cute wreath for Easter so I attached it to the boots too. A few carrots for my bunny. The bunny is holding one of my chippy garden signs from outside. This old picket garden sign is so chippy and sweet. The little garden cups I made to go at each place setting. These were quick and easy to make. If you would like to see how these were made you can go here. I added a egg cup with flowers and a little bunny at each place setting. Tied off my silverware with either a sweet purple spring flower or the bird cage you see below. Just simple and sweet for each place setting. I found these cute little bunny tail chair covers at Pier 1. Thought they were so cute on my chairs. They just velcro onto the chair. I guess I should move them down so it will look like each of my guests have a bunny tail when they sit down at the table LOL! A little Easter on the bench in the dining room. My cute little bunny with some spring flowers. He has his spring dreams basket all ready to fill with Easter treats. Had to show you this cute little kitchen towel I found at Home Goods. Cute little chick with her umbrella and sweet garden boots. Just was too cute to pass up. I have my table ready for my guests for Easter. Yummy Ham, polish sausage, cheesy potatoes, my famous crock pot bacon and hamburger baked beans and pretzel jello and of course Lamb Cake with fresh strawberries. We play games after dinner and have a Easter Egg Hunt. Abby our granddaughter is always so excited to get the clues to hunt for her eggs throughout the house. My two adult daughters and SIL like to hunt for eggs too. I put little prizes, money and gift cards in the eggs and then hide them and give out clues where to find them. I always tell them any eggs not found come back to the Easter Bunny! Come back on Saturday and check out the wonderful blogger that will be in the Spotlight. 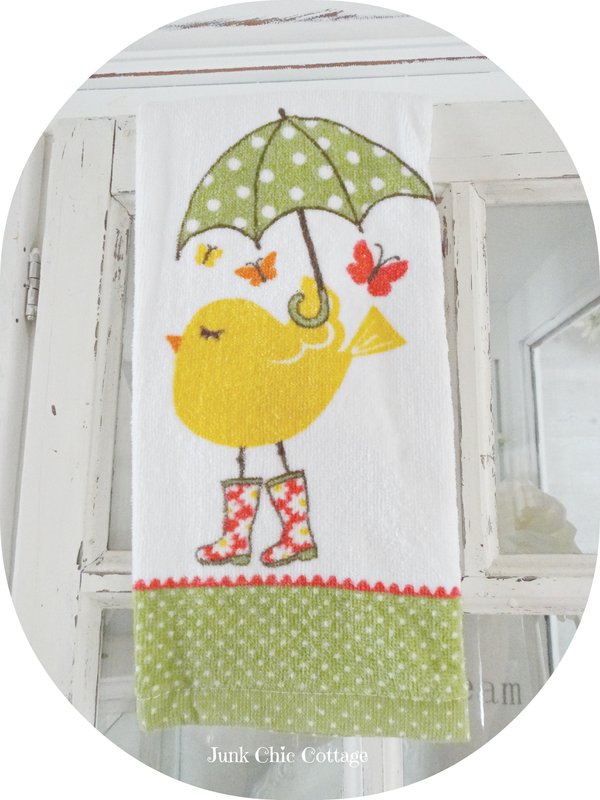 Love that cute chick towel too! What a lovely dining room. The bunny tail chair covers are adorable and so are the birdcage napkin rings. Everything is just beautiful! Your Easter menu sounds yummy...Happy Easter Kris to you and your family! Gorgeous. I love, love, love those boots. What a fun tablescape. Daisies are my absolute favorite too. So lovely and I love the pop of color from the boots! Kris I so want to be a guest at your fun, lively and cheerful table on Easter! Love your centerpiece, your colors burst forth into Spring ahead well hopefully soon ahead (weather is so unpredictable). Pretty White plates and adorable napkin presentation. Oh yes ... move down the cute bunny tails so everyone sports one this Sunday. Pretty plus mon amie do not forget to take pics of everyone's fluffy tails. I forgot even your menu sounds like a fun celebration! Those bunny tail chair covers!!!! LOVE those! So cute! I immediately noticed the bird cage napkin rings too. Very nice! 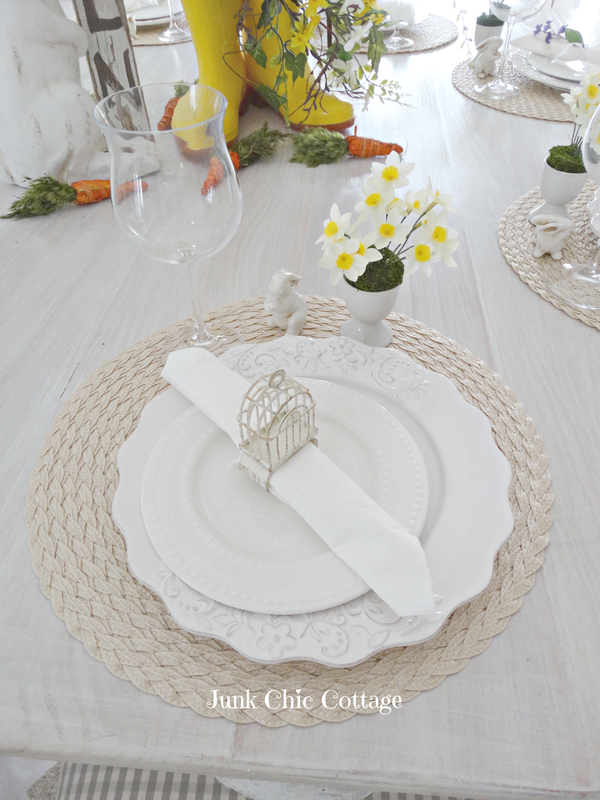 I think Easter tablescapes are my favorite. :) Wishing you and your family a wonderfully blessed Easter! Such a sweet table vignette.....I'm not sure which is my favorite part?!?! The boots...... the birdcage napkin rings, or the adorable bunny cotton tails on the chairs....I love it all!!!!!!!!!!!! Your table is so pretty! Everything looks so inviting. Especially love the bunny tails. You are so clever with your decorating. The view from here is so magical, yet to cottage chic Easter. 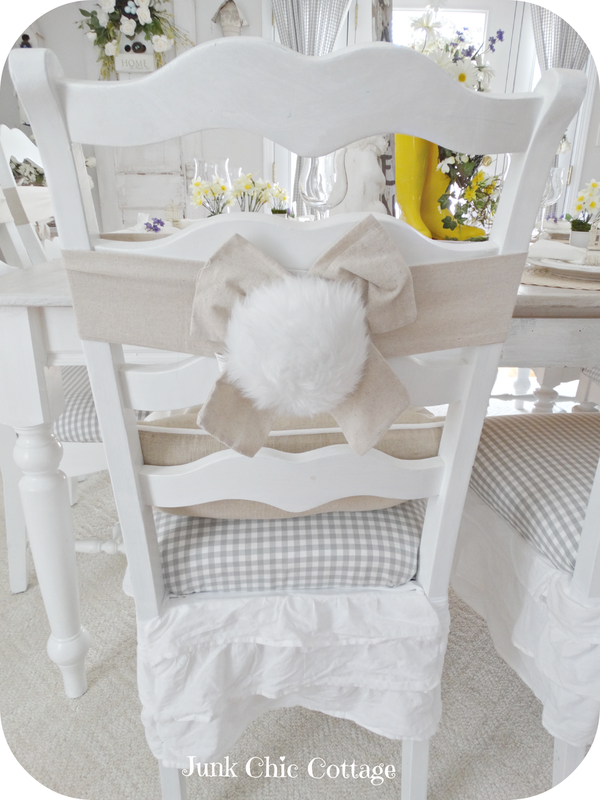 I love, love those cute bunny tails dressed on your ladder back chairs, they look so cute. I can see a Estaef Brunch here with you, guest will not leave disappointed. Thank you for the spring inspiration. Darn that spell check...* Easter Brunch. Kris, those little garden cups are the cutest things! This is the perfect Easter table filled with colors and charms. Have a happy Easter with your family! Your table looks beautiful and so ready for Easter. Sounds like you will have a full house and lots of fun. Enjoy. PS - I got those darling bunny tail chair covers also. Aren't they the cutest thing ever? 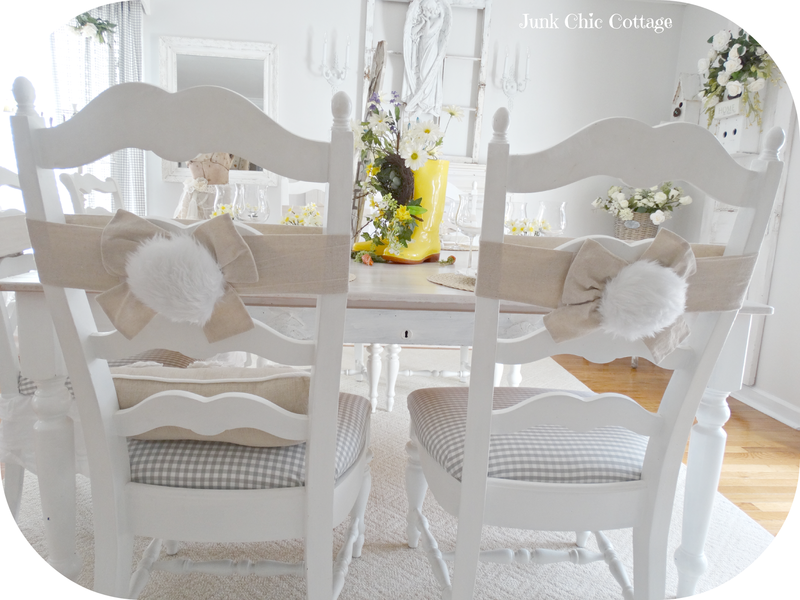 Those bunny tails are so precious and the perfect fit for your Easter dining room !!! Kris, everything looks so beautiful!! I love the little flower cups and the tiny bunnies at each place setting. LOVE the bunny tails on the chairs!! :) You are a pro in decorating and it's going to be a great day for your family. So cute, Kris! Your table is beautiful and I love the adorable tea towels. Hi Kris, I love your Easter table! It looks so pretty and festive. Have a wonderful time with your guests and have a Happy Easter! Your table setting looks wonderful, Kris! 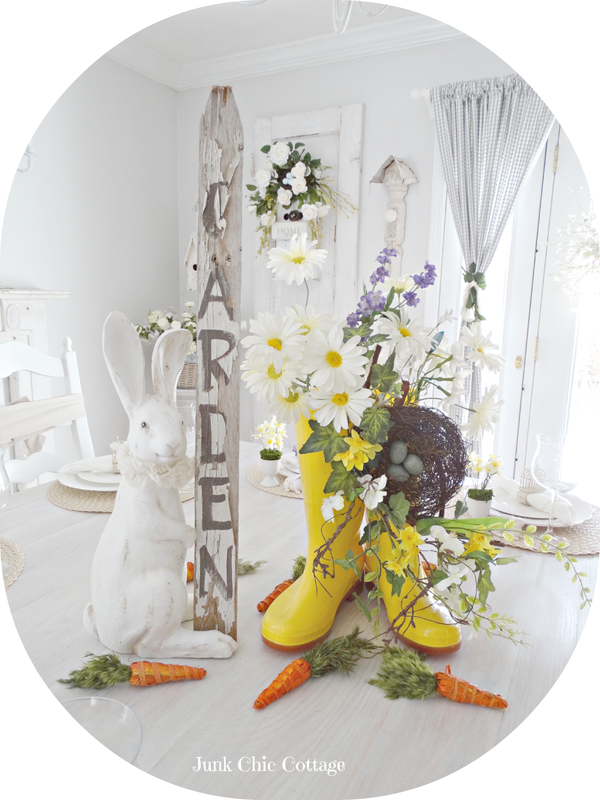 The center piece is adorable with the bunny and the white picket! LOVE the boots, too! You are so creative, girl! Happy Easter to you, and your family! Some people are know as 'the bag lady' or 'the cat lady' but I think you are 'the flower lady'! 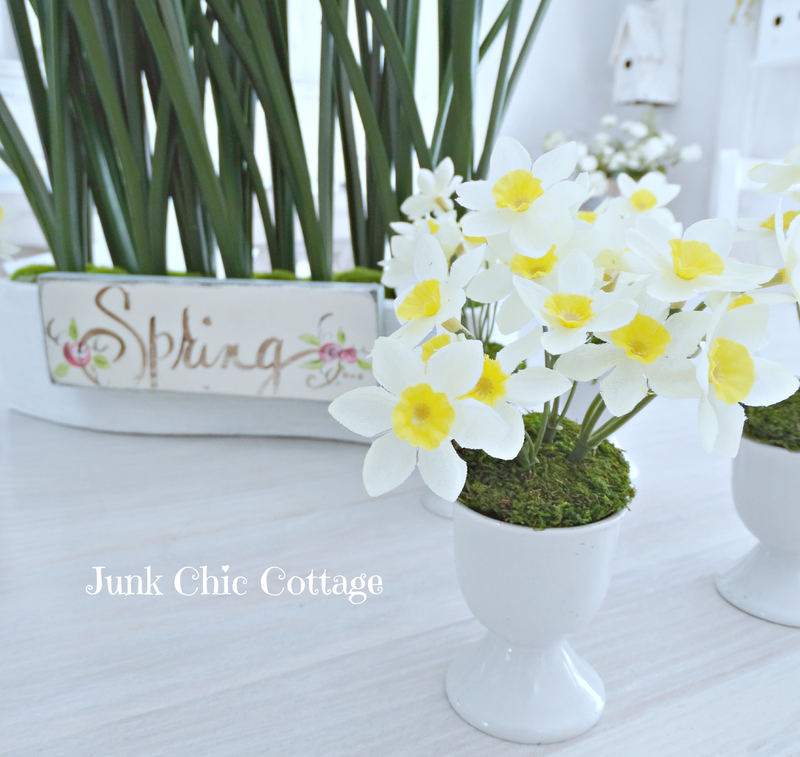 Looks very Spring in your home. Those cotton tails are cute. I hope you have a wonderful Easter. Wow Kris everything you touch turns to beautiful! I love your pretty table setting and those bunny tails are adorable. 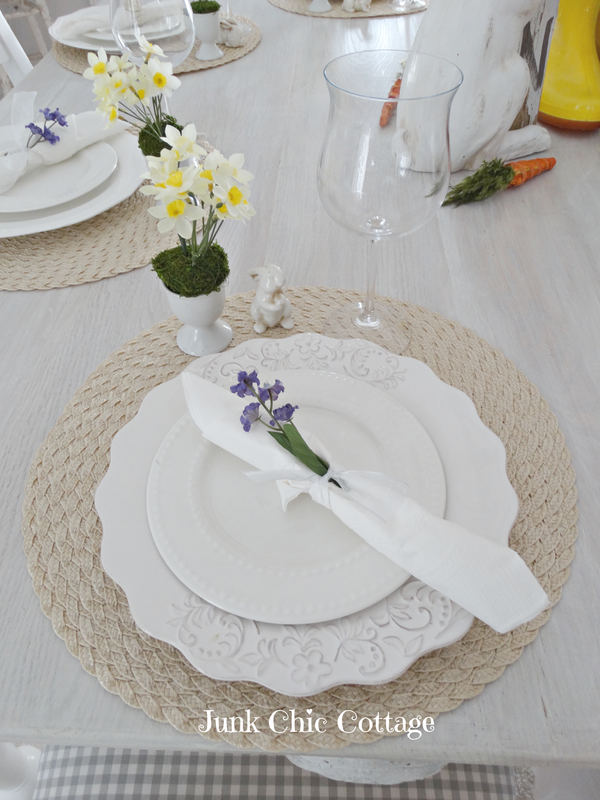 Very nice Easter table setting! The yellow is a perfect touch. My daughter & SIL are having Easter dinner...Love the bunny tails on the chairs! Very pretty! I really like the pops of yellow in the lovely white setting. Enjoy your Easter celebration with your guests. Beautiful, Kris. I love the bunny tails!!! This year, I thought that Pier One had the most adorable Easter decor of a chain. What a lovely tablescape for Easter, Love the bunny tails on the back of the chair, the yellow helps to make the tablescape pop. Happy Easter to you and your family! Oh Kris, how pretty everything is! You simply blow me away with your talent at making flower arrangements look so easy! I sure do wish I was one of your Easter guests....I wouldn't eat though, I'd be ooohing and awwwing over everything in your lovely home. Those are the cutest bunny chairs ever!!!!! Love it all!! Love your sweet table setting. I adore the soft colors and the bunny tails are just adorable. Enjoy your Easter with your family, your meal sounds delish!!! I don't usually comment let alone gush...but gush I must! Totally gorgeous! Those bird cages really got me and ...well just everything! It looks so beautiful! You and your family will have a lovely day thanks to you and your talents!!! Enjoy! Oh Kris, your table is beautiful and so eye catching. The bunny tails on the chairs are so cute. You have left no stone unturned - the table is stunning. Have a wonderful Easter with your family and I know the little one is so excited to have the Easter Bunny visit. Your easter table is stunning! The bunny tails on the chairs are wonderful. You are very creative. Cute table, Kris and that would be funny if you moved the chair bow further down...be sure to post pics of your guests if you do! :) Have a Happy Easter and enjoy the fun with your egg hunt! Kris, what a great tablescape with all the little extras. Those bunny tails on the chairs are ridiculously cute, and the towel to go with your yellow boots on the table is perfect. Sounds like my family bash has crashed - my sil bowed out at the last minute as host, and her request for me to host at such a late date is just not going to happen. My vote is for diner out, we'll see. smh Have a wonderful time with your family. This is ever so sweet! So many delightful details Kris! How charmed your guests will all feel sitting there. ;) On another note...I finally got the recent issue of RC and was thrilled to see your feature up close! Seeing both yours and Susan's homes inside is so very exciting! You both should be so proud! Your homes are beyond beautiful and should be shared by many! Kris those bunny tail chair covers are too cute!! Everything looks so pretty!! Have a wonderful Easter my friend! This is absolutely gorgeous Kris!! I love how bright and airy everything is. Have a wonderful Easter!! 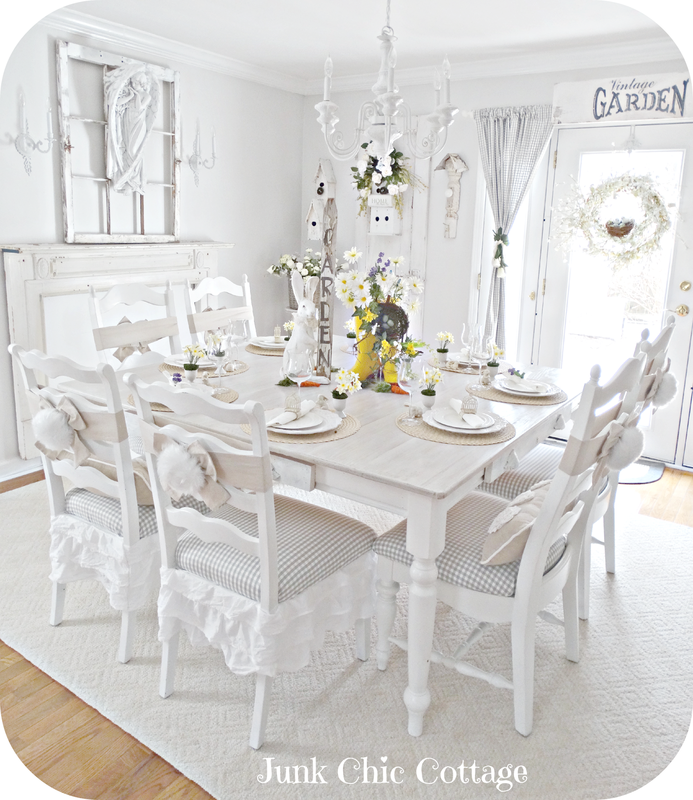 Your table looks so pretty all dressed for Easter dinner! Love the centerpiece with the yellow boots...so cute! Sounds like a wonderful day planned with your dear family. Hi Kris, your table setting is simply gorgeous. I love your yellow boots and the sweet bunny tails are adorable. Wishing you and your family a very Happy Easter. The table is magnificent....along with all of the beautiful Spring touches about your home....and if you had to pin me down and ask me what I love the most?....those adorable bunny tail chair decor!....so creative Kris!....and we too do a "scavenger hunt" for our granddaughter...she loves solving the clues...Have a wonderful, wonderful Easter with your family Kris! Very pretty. Your yellow boots filled with flowers made a cute centerpiece. Happy Easter! 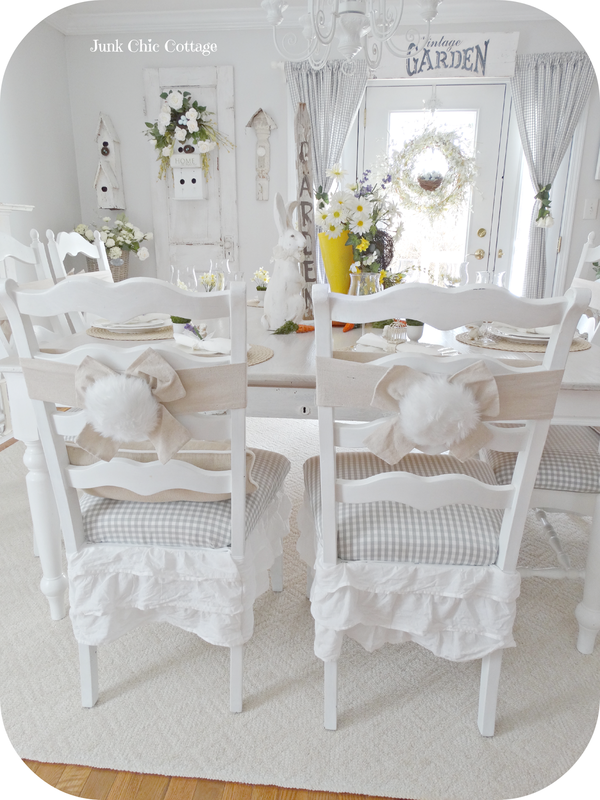 Kris, I love your pretty Easter table and the back of the chairs is way too cute! Of course you added that cuteness. Wishing you a very Happy Easter! What a beautiful table setting! I love your bunny statue and I think the birdcage napkin holders and bunny-tail chair decor adds that one of a kind Junk Chic touch! Adorable! So cheery with the yellow. So sorry to hear about your darling little Penny! Such a sweet photo with your daughter. Condolences for all of you. Have a sweet Easter Day! Charming table! I think I need those boots since we've had very wet weather lately! Very warm and welcoming setting. Have a wonderful Easter dinner! Oh my, this so beautiful and cheerful! Wishing you calm and blessed Easter! It looks so beautiful! I love the little floral arrangements in the egg cups and the bunny tail chair backs! Happy Easter! Gorgeous table! The chairs bunny tails are adorable! Kris, I love your cheery yellow boots! 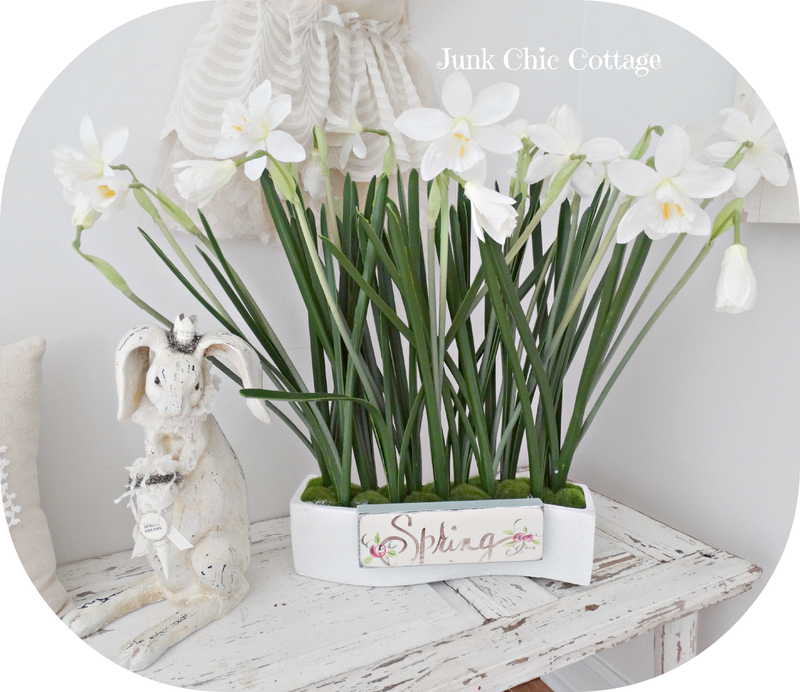 The bunnies and the daffodils are just perfect for Spring. How cute are those bunny tails and that fun towel? Thanks for sharing with SYC. I finally found the Romantic Country magazine and loved the article showing your gorgeous home! 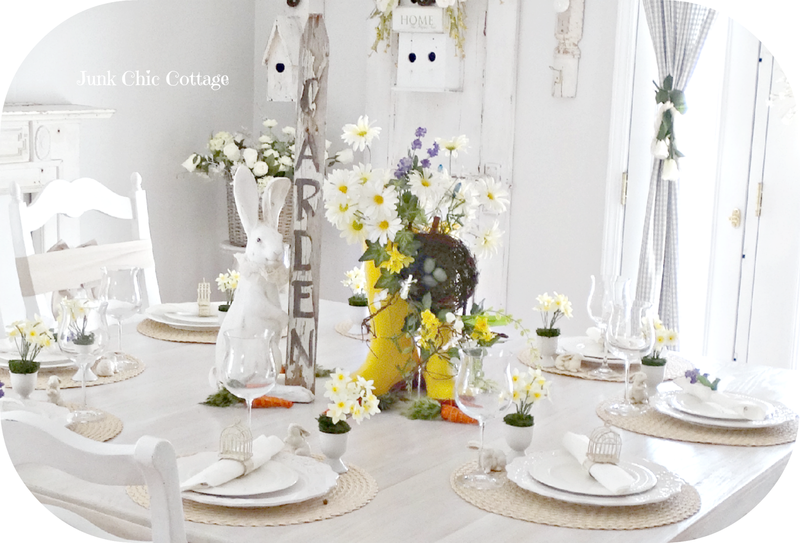 Your Easter tablescape is fab! Both the birdcage napkin rings and the little purple flowers are adorable. My favourite however is the bunny with the turned down ears, so cute!